Everyone reads the obits in the newspaper when someone famous dies. Even if the person isn’t famous but contributed to society in some meaningful way, an obit can be interesting or enlightening. But who writes them? in OBIT. the filmmakers look at one of the writers for one of the last remaining obituary departments in the country. Of course it’s at the New York Times. These men and women aren’t ghouls or obsessed with death. They are great writers who enjoy telling interesting stories. Director Venessa Gould gives us a look inside through interviews with the writers. They are former culture or entertainment critics who have moved to this new job. They take their jobs very seriously, but also have a sense of humor about what they do. They feel its important and are trying to keep their corner of the business alive. The film is very interesting. You learn how they put the obits together and what the standards are. Who gets one and who doesn’t. How they find a way into certain lives that may make someone relatively obscure interesting to the masses. 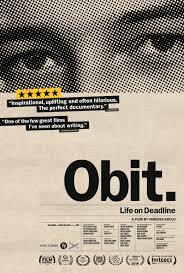 Throughout the film the writers are working on various obits. You see the creative process unfold. It sounds like it may be deadly (pun intended) dull, but it’s interesting because these writers are fascinating people. But my favorite person in the film is the man who runs the Times’ Archive. The library of old clips and photos the writers and editors use as source material. He is kind of nerdy in a “lives in his parents basement” kind of way, but he also knows where all the bodies are buried. Literally. He is a true character. OBIT. give us insight into a part of the paper that is largely ignored and rarely thought about. The best compliment I can give is that it made me want to run to the Times’ Obit page and read about who died. After SICARIO and HELL OR HIGH WATER one could argue Taylor Sheridan was among the best screenwriters in the business. 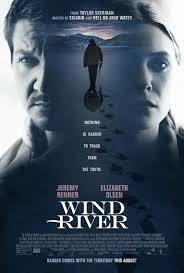 With WIND RIVER, Sheridan cements that reputation. Sheridan specializes in stories that speak to broader issues yet are intensely personal. The idealistic DEA agent in SICARIO who learns what battling Mexican drug cartels is really like. The brothers who are trying to save the family ranch in HELL OR HIGH WATER while sticking it to the bank that ripped off their mother. Now Sheridan tackles the neglect and mistreatment of Native Americans in WIND RIVER through the lens of a murder mystery. 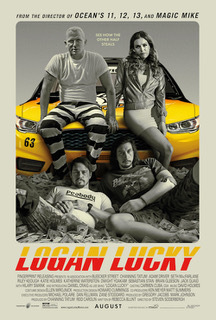 There are several special performances in this movie, chief among them Jeremy Renner. He is a tracker for the Wyoming Department of Fish and Wildlife. He hunts down animals who have come too close to humans and kills them. He is divorced with at least one child. Don’t want to spoil too much.. but he did have an older daughter who is dead. That seems to have ended his marriage. While tracking down some mountain lions on the Wind River Indian Reservation he comes across the body of a young woman frozen in the snow. That is the inciting incident that sets the mystery in motion. The reservation police force isn’t equipped to investigate this, so the FBI is called in and they send one agent, a young woman played by Elizabeth Olsen. She is driven and dedicated and want to track down the murderer, but is somewhat thwarted by the politics and culture of the reservation and the brutal Wyoming winter. She enlists Renner’s help because he is something of a “track” whisperer. He can interpret tracks in the snow and knows there is more to this story. The investigation takes several twists and past tragedies are revealed in a way that is both surprising and satisfying. When we finally learn how the young girl was murdered, it is shown with brutal realism. There are several winning performances here. Olsen’s innocent earnestness feels true. Graham Greene as the tribal police chief is a delight. And Gil Birmingham (Jeff Bridges’ partner in HELL OR HIGH WATER) steals his few scenes as the grieving father. But it is Renner who takes Sheridan’s story and drives it with a ferocity I have not seen from him since THE HURT LOCKER. His grief lives just beneath the surface, yet he is wise and calm in the face of more tragedy dropped into his life. It is a fabulous performance. I should also mention the cinematography by Ben Richardson would do Roger Deakins proud. His sweeping shots of the relentlessly cold Wyoming mountains add to the bleakness of feeling. Sheridan has crafted a murder mystery that manages to also say something important about Native Americans and how they are isolated and ignored by the United States. Drugs and violence are part of life. The murder is so unimportant to the FBI they drag Olsen’s character out of a conference to send one agent to investigate. It’s easy to read between the lines and see the truth. Sheridan deals in truth. It’s brutal truth, but told in such a compelling fashion. And that is what makes Sheridan one of the best screenwriters in the business and what puts WIND RIVER on best of 2017 list.